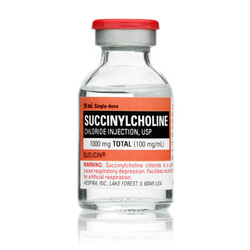 Succinylcholine is known in endotracheal intubation during any emergency or surgical procedures. Succinylcholine will cause the muscle paralysis. Succinylcholine may lead to phase I blockade and phase II blockade. Phase I blockade begins by the reversible binding of the succinylcholine to the nicotine receptors at the neuromuscular junction. Succinylcholine which is a depolarizing neuromuscular blocker will compete with acetylcholine to bind to the nicotine receptors. This will results in muscle fasciculations due to continuous depolarization at the neuromuscular junction. Cholinesterase inhibitor is useless in this case and may worsen the condition. Phase II blockade may focus on the inability of the receptor to transmit action potential pass through the neuron even if the receptor is activated. This occur due to desensitization of the nicotine receptor by continuous interaction with succinylcholine while the ion channel begin to repolarize. This condition is reversible by the introduction of physostigmine/ cholinesterase inhibitor. Succinylcholine may lead to malignant hyperthermia if it is administered with halothene. Malignant hyperthermia is characterized by elevation in the body temperature and increase in the muscle rigidity. Malignant hyperthermia is treated with dantrolene. Dantrolene decreasing contraction of muscle by inhibiting the calcium release from the sarcoplasmic reticulum of the myocytes.